Each day we see newspaper headlines and hear radio and television news bulletins about opposing religious groups, political parties or ethnic pursuasions from every country attempting to position their perspectives or policies ahead of their opposition. When neither side gives in to the other or negotiations fail to bring about a peaceful agreement then some form of retaliation is either threatened or carried out. It would seem that by now we all would have realized that no one wins with retaliatory actions and that peaceful coexistence and cooperation is our only real solution. 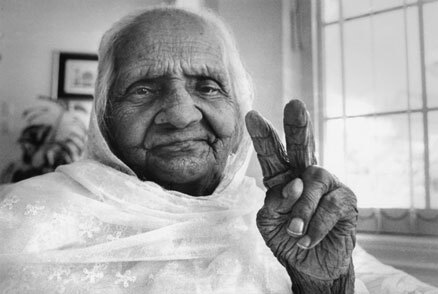 Peace Arch City resident Aphijan Buksh who will soon be 103 years old practices what she preaches. She contends that each of us must set an example for others to follow if we are to see global peace in this era of massive nuclear weapons and rampant disregard for other cultures. Aphijan is a practicing Muslim who also believes in Jesus and finds value in all religions. "When we respect others we have no need for war and killing,"
says this great, great, great grandmother with a determined voice. At the same time she is making a peace sign for further emphasis.